Let’s face it; what you drive is an extension of you, your personality and your aura. 1. Confidence. Perception is often much more important than we think. That said, the Bimmer has always been effective at creating a certain aura of confidence (and affluence). From its beginnings in 1916 as a German aircraft engine producer, the BMW brand has grown to the point that it now owns both Mini Cooper and Rolls Royce. With annual revenues north of $80 billion, BMW can well afford to keep its products high-end enough to be considered status symbols. 2. Curb appeal. Not too long ago BMW sponsored one of my events. We had a BMW 435i Hardtop Convertible on display outside the venue. It was silver with a snazzy red leather interior. People stopped and stared and one of our event attendees was so taken with the car that, even though he wasn’t actively shopping, he decided he had to have it. One week later he had that very same car parked in his driveway. 3. Performance. If performance is your thing, then take the road less traveled and get into the BMW Alpina. Not readily known to the average car shopper, Alpina is recognized as a separate auto manufacturer even though their only function is retooling BMWs. An Alpina-tweaked BMW comes with a few distinct features in addition to the iconic Alpina logo, like 20-spoke alloy wheels, “Alpina Blue” metallic paint, sumptuous interiors and, of course, high performance. 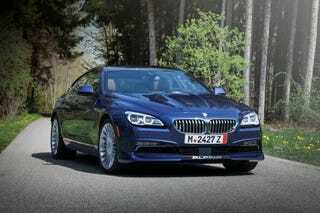 The Alpina line emphasizes horsepower and torque, i.e. acceleration from a standing stop. These off-the-beaten-path cars are sold at BMW dealerships but if you’d rather stay tried-and-true, the M designation on any BMW means it’s racetrack ready. Seriously. 4. Green power. Muscle car lovers take note: We live in a brave new world where being green matters. Thankfully, BMW has already heeded the clarion call. The BMW i3 is interesting for a few reasons. It’s got a futuristic look, which, personally, I love in a hybrid electric/gas vehicle and, despite its blocky shape, the i3 is plenty fast. Since it’s electric, all the power is available immediately, as soon as you press the gas pedal. Plus it’s got a relatively low starting point of $42K. If all that didn’t grab you, try this. Yahoo Autos named the BMW i3 their 2015 Green Car of the Year. Buy the i3 with the built in range extender and the i3 will give you a fairly robust 150 miles per charge. 5. Size. At the 2016 North American International Auto Show, BMW revealed the X4 M40i Sports Activity Coupe. This ride is BMWs attempt to dominate the very competitive premium mid-size vehicle segment. The M40i is a quick, nimble BMW that you can fit the whole family in. Plus, it offers a wide array of “ConnectedDrive” options like, a full-color heads-up display, Lane Departure Warning, Forward Collision Warning, Pedestrian Warning and City Collision Mitigation. All of which are fancy ways of saying this car helps keep you safe. Period. 6. Culture. Owning a car isn’t just about the car itself but also about the company that makes the car. That said, BMW strives to stay connected to the arts in a number of ways. As a kick-off event for 2015’s Frieze Art Fair New York, for example, BMWi and SoHo House presented an art talk, entitled, “The Relationship between Art and Architecture.” The event featured African architect David Adjaye, who is considered a leading architect of his generation. Additionally, BMW collaborates with Art Basel on a global initiative to recognize emerging artists. 7. Cost. Owning a BMW need not cost you your first-born plus a bag of unicorn horn dust. The BMW 228i, for example, starts at a very manageable $32K and, nope, you won’t be sacrificing anything. The 228i, like it’s more expensive siblings, is fast, elegant and stately. Try it. 8. Innovation. Also revealed at this year’s North American International Auto Show was the BMW M2, a sports car derivative of the 2 Series. Says BMW, “the first ever BMW M2 features the renowned BMW M performance complimented by a sleek interior and exterior design.” Meaning they intend for the M2 to be an everyday car that’s capable of the extraordinary. And the starting price of $51K makes it a fairly accessible for a supercar. 9. Fun. What’s the point of being in an “ultimate driving machine” if you can’t have a little fun? Even in a field of extraordinary cars, there is something very special about the sleek, engine-focused chassis of the Z4. Halfway through my test drive I pulled into a gas station looking for aspirin. You would have thought Will Smith had just walked in. There were whispers, glances and ultimately the check out clerk tossed her hair and asked for the keys. That kind of fun is worth having in your life. 10. Luxury. I mean, you already know that the BMW is a luxury car. And you just learned about the Alpina but did you know about the Competition Package? Thought not. Available as an upgrade for the M3 and M4 Coupe/Convertible it offers an increase to 444 hp and also includes unique aesthetics like sporty black chrome tailpipes.